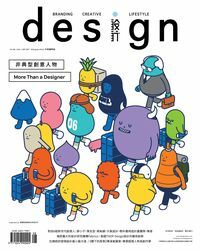 'design' has been issued for over thirty years since 1980 and now is the leading design media as well as communication platform in Taiwan. In 2005, Taiwan Design Center (TDC) pushed the transformation of 'design'. The new edition 'design' is based on the original industrial design information and covering all kinds of design fields with the main theme of “Branding, Creative, Life Style” by reporting the design news, product information, brand research and market trend. We also holding expert forum, expressing the latest design concepts, reporting design competitions, hot topics and feature interviews. With the rich contents and the clear market segment positioning, design provides advertisers the best advertising space for high quality design advertisement and the most effective reader group!